Our Team of qualified and experienced florists create beautiful flower arrangements for all occasions. From modern designs such as handtied bouquets to more traditional designs such as baskets and posys, our florists create bespoke designs, often to customers specific requirements. Our florists are here to advise you on all aspects of floristry and can support you when making important decisions regarding flowers for happy times, such as weddings and for difficult times, such as following the passing of a loved one. Please feel free to contact us directly and speak to one of our florists to discuss your needs or alternatively click on a link below to order your flowers online. We deliver within the Andover area and also make deliveries to the surrounding villages. Please note that due to seasonal availability of flowers it may be necessary to vary individual stems from those shown. Our skilled florists may substitute flowers for one of similar style, quality and value. Where our designs include a sundry item such as a vase or basket it may not always be possible to include the exact item displayed. If such occasion arises, we will make every effort to replace the item with a suitable alternative. 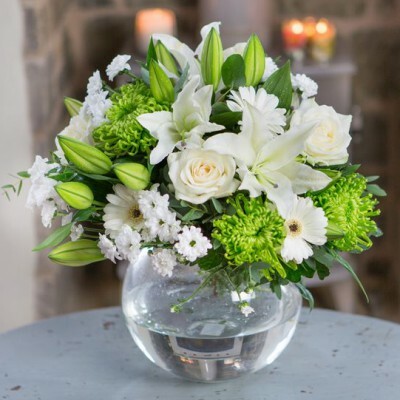 We can also help you with arranging for flowers to be sent to other areas within the UK. Just give us a call on 01264 323893 to discuss your requirements. Unfortunately we are currently unable to help our customers with sending flower orders abroad.